Records and Information Management is raising awareness of digital compliance policies and practices such as records retention, email management, and best practices in records management. 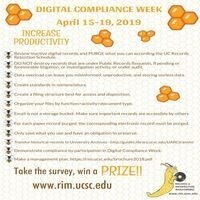 We encourage everyone to follow these practices year-round but hope that Digital Compliance Week will serve to motivate. Please share this event with colleagues and encourage your office to designate time during the week of April 15 - 19 to get started and to develop practices to stay in compliance year-round. You can also complete a brief survey to quiz your knowledge of best practices and receive a small prize. Please visit our website for additional resources and never hesitate to reach out to Records and Information Management with any questions or requests for assistance.